What’s the Best Time to Go Dog Sledding in the Nordic Countries? This is a question we’re commonly asked when our guests are planning their winter adventures. But the answer is not such a simple one! We’ve summarised some of the main points to consider below. 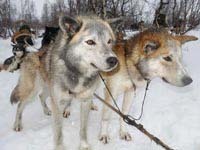 For additional information, please see our website article When To Go Dog Sledding. In the far north, the winter season is long, with conditions normally suitable for sledding from around mid-November and extending, depending on the area, well into May. So with almost 6 months of potential husky holiday season to choose from, how do you decide when to go? This can be a very quiet time to travel, and you may find flight costs lower compared to peak travel periods. November can be a good time for Northern Lights, as the skies are nice and dark at this time. 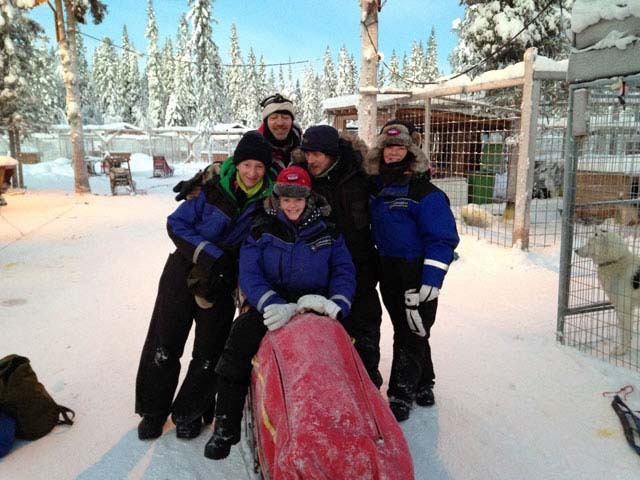 Typically, conditions are suitable for sledding from around mid-November – for example, our One-day and Overnight Husky Tours in Kiruna and Discover Dog Sledding in Lapland tours are possible at this time. It is of course important to bear in mind that nature is unpredictable and exactly when the snows arrive will always vary a little from year to year. If your plans are flexible, we therefore recommend choosing dates from late November onwards for the best chances of good snow conditions. This is the deep midwinter period, when in the far north the sun doesn’t come above the horizion at all. November and December have a real deep midwinter feeling. Photo: Hariprasad Kuppuswamy. Early December and the lead-up to Christmas can be a very good time for a dogsled tour, with less pressure on availability and possibly lower travel costs compared to Christmas/New Year. 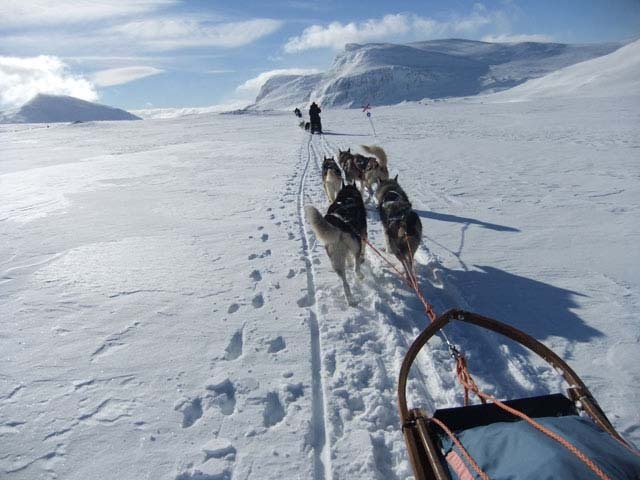 Longer tours, such as Northern Lights Dog Sledding in Lapland, start to run at this time. The Arctic midwinter period is a real experience with a very different atmosphere compared to sledding in March or April. Conditions may be more challenging, with lower temperatures and of course much reduced daylight, but weather conditions can be variable whichever time of year you travel. It can be zero degrees at Christmas and -25 degrees in March, or vice versa! The equipment and clothing and of course the dogs and guides are all well-accustomed to operating in a range of winter conditions. For those of us in the UK, it’s tempting to think of Christmas/New Year as the “real” winter and therefore the ideal time for a winter holiday, whereas the reality is that February-April is the time many locals consider best for winter activities. 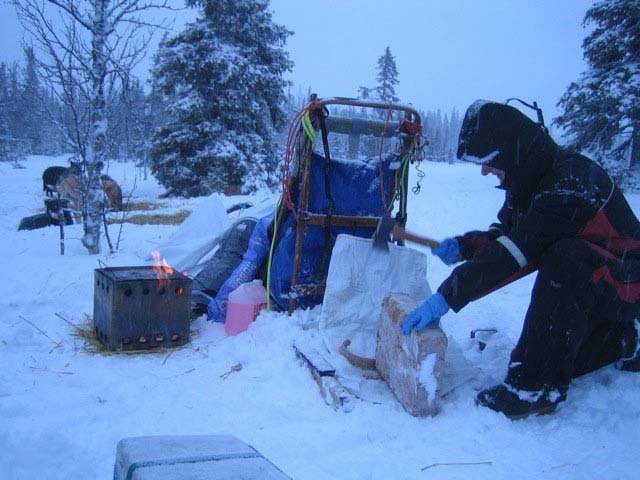 Nevertheless, the Christmas and New Year period is of course one of the most popular times of the winter season to travel – seeing in the New Year in a wilderness cabin after a day’s mushing is a wonderful way to start the year! Feeding and working with the dogs during your tour is an essential part of any trip. Photo: Heike Oberg. For those with some flexibility with their travel dates who are not restricted to travelling during the Christmas holidays, January can be a very good option. After the peak of Christmas/New Year, it’s a quieter time to travel and flight costs may be lower. The nights are still long and dark with plenty of opportunity for Northern Lights (when the skies are clear), though January can also offer some of the most challenging weather conditions and lowest temperatures. January can be a good time for adults to travel for tours such as Dog Sledding and Northern Lights in Vindelfjällen. 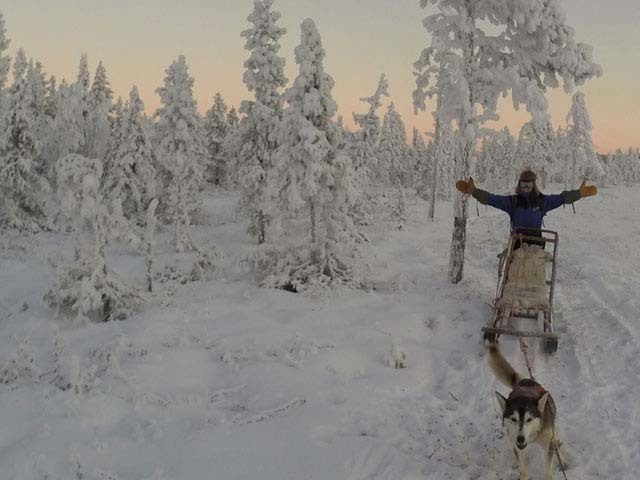 This is also the time when tours located further south, such as Go Dog Sledding in Trondelag and Private Dogsled Tours for Two in the Taiga Forest, where the winter arrives later, offer their first tours of the season. 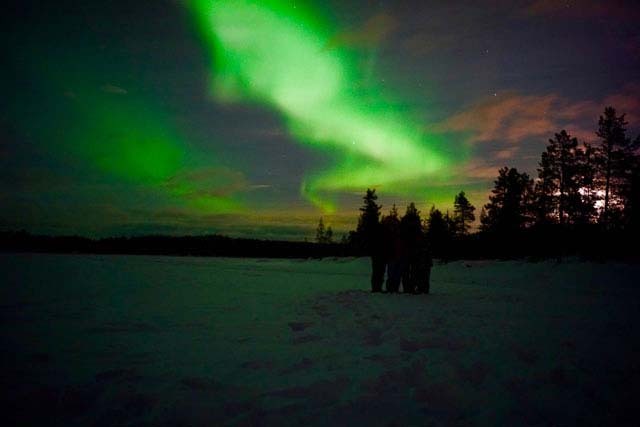 The Northern Lights can be seen on dogsled tours anytime from November to early April. Photo: James Cartwright. By February, the winter is transitioning from dark to light – the Midwinter period is just behind you and the Spring Winter period just in front. February is when Nordic schools have their main winter sports break, and this combined with the the UK February Half Term makes February a peak period for travel, particularly for families, so availability around mid-February especially can be extremely limited and flight costs may be higher than at other times, especially if booking at short notice. If you’re travelling with children, this is likely to be a key period for you and family-friendly tours such as Discover Dog Sledding in Lapland are very popular during this time. As February progresses, the days become longer. Photo: Lucy Fishburn. As March arrives, it’s spring in many parts of Europe, and travellers’ minds may be turning from winter adventures to dreams of warmth and sun. In many ways, this is a shame, because now begins what locals often consider the absolute best time of the winter – the “Spring Winter”. Cabins in the mountain areas such as those used for our Husky Mountain Expedition in Lapland will only have opened in late February and the winter season for dog sledding in the mountains is just beginning (conditions being unsuitable, with the lack of daylight and challenging weather, to dogsled in the mountains earlier in the season). From March onwards is the time to go if you want mountain views, longer hours of daylight, a spring feeling in the air and also if you are interested in combining a dogsled tour with winter camping, such as on our Dog Sledding and Winter Camping on the King’s Trail tour. 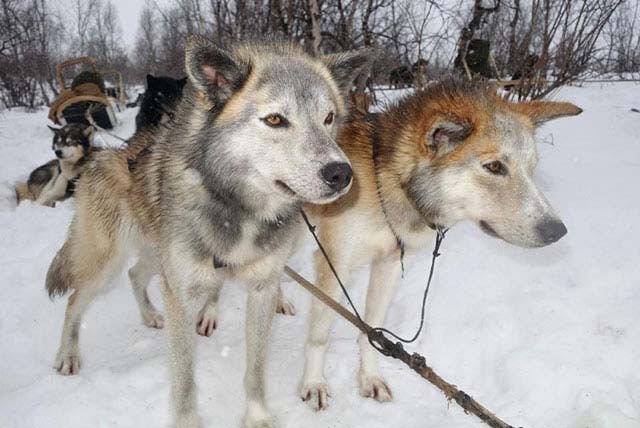 The “spring winter” in March and April is the time for dogsled tours in the mountains. Photo: Nature Travels. There are still very good chances for Northern Lights and, while you may have to stay up later to see them until the skies are dark enough, the Spring Winter can also have more stable weather and clearer skies, making a display of the Aurora easier to see. Temperatures will also typically be milder compared to the Midwinter, but this is by no means always the case – there’s nothing like sledding with a fresh -20 degrees C on your face beneath the bring spring sunshine! Mountain dog sledding offers a glorious combination of mushing adventure combined with dramatic scenery. Photo: James Padolsey. Even more than March, April really is the “forgotten month” of the winter season and still an excellent time for dog sledding. For areas further south (except in southern mountainous areas such as Norway, which still have excellent conditions at this time, for example for Husky Sledding at the Foot of the Jotunheimen), the winter will be drawing to a close, but up in the far north and in the mountains there’s typically still plenty of snow. 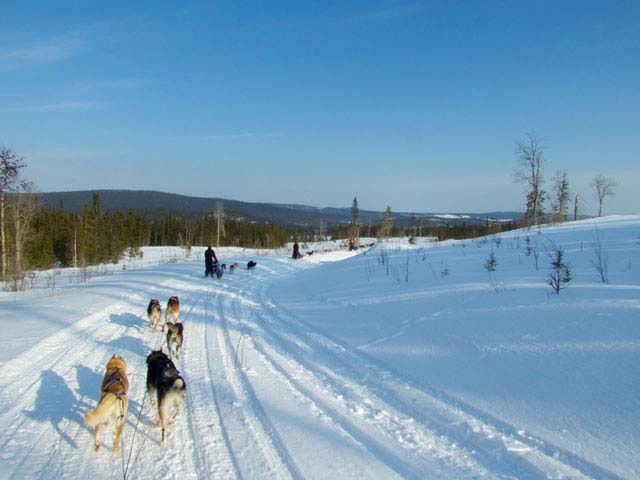 Lowland tours in the north such as Northern Lights Dog Sledding in Lapland as well as the mountain tours continue to run well into April. Temperatures may even be plus degrees during the daytime, and in warm weather the snow can fell heavier during the day as it warms, but everything refreezes overnight when the temperatures drop below zero again. This is even the start of the season for some tours! Our Wilderness Dogsled Adventure in Vindelfjällen begins in late March, while all the way up in Svalbard, the first tours of the season don’t start until April! The daylight hours increase rapidly during this time, and after the first week of April of so, it is now too light to see the Northern Lights (they’re still there of course, just as the stars are there in the daytime but can’t be seen!) – but in return, you’re rewarded with glorious long days of spring sunshine. As the name suggests, for Midnight Sun Dog Sledding in Svalbard, you’re already in the realm of 24-hour daylight! By April, the daylight hours extend well into the evening. Photo: Corinne McManus. Even the most northerly mainland locations will normally be feeling the spring melt by May, but early May can still be a good time for sledding in northerly locations. As with the start of the season, the spring thaw and the end of the winter season of course comes later some years and earlier others. 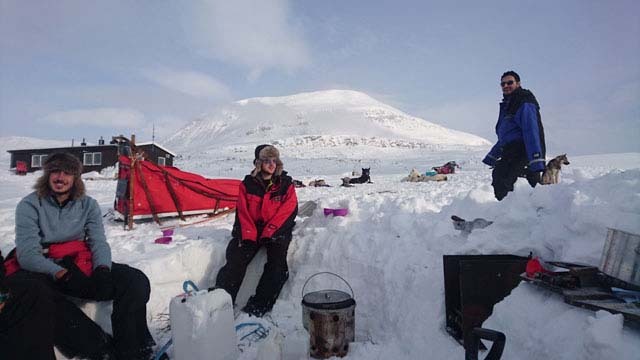 But tours in Svalbard are still in full swing at this time, while at our Aurora Husky Adventure in Finnmark, conditions may also still be suitable. In some locations in the far north, conditions for sledding extend well into May, giving the possibility to combine a husky expedition with seeing the Midnight Sun! Photo: Jenny Raberg. So where does this leave you for deciding when to travel? If you’re travelling with children and are restricted to school holidays, Christmas and February Half Term will be the most popular times. For younger children who may find Midwinter conditions challenging, February may be the best choice. However, Easter, depending when it falls, may be the one you haven’t thought of but could be the best choice of all! If you’re travelling as adult(s) only and have flexibility with dates, then the choice comes down to whether you prefer to experience the deep Midwinter, the “between” February period, or the Spring Winter that follows it, all of which have their appeal. Also consider whether your preference is for a lowland tour, mountain tour or if you wish to take your trip to the next level with winter camping. 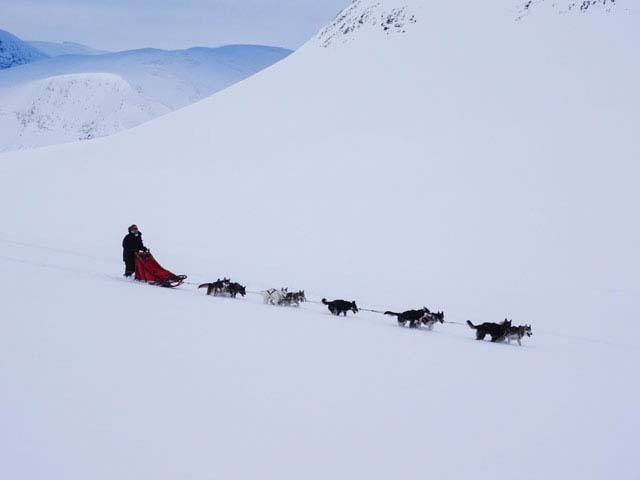 Whichever time of year you choose, we hope that you will find dog sledding an unforgettable adventure! We understand that with so many things to think about, choosing the right dogsled tour for you is not always easy, and we’re happy to answer any questions you may have to assist you in selecting the perfect option. Get in touch and have a chat!